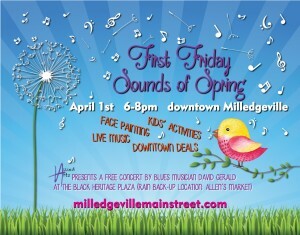 The birds and the sidewalks of downtown Milledgeville are singing with the Sounds of Springs. Among the things to enjoy, as the weather invites you to come outside, are live music, kids’ activities, spring shopping, sales and dining deals. Tune in to the jams of Charlie Adams, Jim Chapman and Nic Goodman as they liven up South Wayne St. American singer/songwriter and Milledgeville native Scott Little will be playing live near Amici. Little has performed with well known names in music, some of whom are Eric Church, Jake Owen, Zac Brown, Lynyrd Skynyrd, and Chris Stapleton. Little is currently working on his 6th album and is also the current president of the Milledgeville Jaycees. Allied Arts presents an outdoor concert of the David Gerald Band at the Black Heritage Plaza, between the historic Allen’s Market building and the Milledgeville Police Department beginning at 7:30pm. David Gerald is the son of Mississippi born and raised parents who grew up to the sounds of Blues and R&B music. Seating is in the Plaza courtyard and bringing a lawn chair is recommended as bench seating is limited. The concert is free and open to the public. *In the event of rain, the concert will be moved indoors at the adjoining Allen’s Market building. Face painting favorite Lisa Marie Barry is back to brighten kiddos’ faces with a variety of designs from which to choose. The Georgia College Chemistry Club’s Kids Corner will kick up the science fun with an educational activity designed to delight and inspire. Delta Sigma Theta has an interactive activity to raise awareness of community & nation-wide issues. The GC Ethics Class & Baldwin Co. Animal Shelter invite participants to decorate cookies and dog treats at their table for themselves & the community’s four-legged friends. Stop by the Mary Vinson Memorial Library’s table to get an edge with info on the Spring Book Sale, upcoming on Saturday, April 2nd. Exchange Bank will host a coloring contest for the future Picasso’s & Monets and the Rotary Club extends an olive branch and activities to promote peace day. 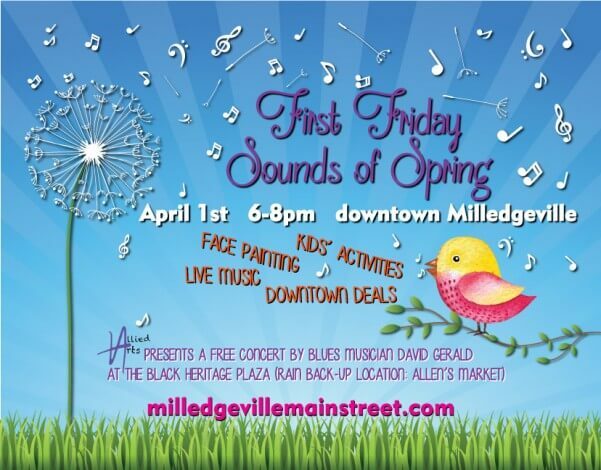 For more information about First Friday or for information on how to get involved contact the Main Street Office at 478.414.4014 or email Deana at dthornton@nullmilledgevillega.us.